Space shuttle Atlantis casts off from the International Space Station on May 23, 2010 after a week-long stay to add a new Russian room and other spare parts to the orbiting lab. It is the last time Atlantis is scheduled to visit the station and fly in space. Thisstory was updated at 12:47 p.m. ET. 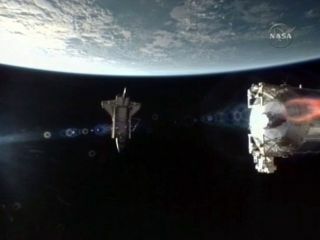 Thespace shuttle Atlantis has begun the trip home from orbit. The shuttle's sixastronauts bid farewell to the International Space Station early Sunday after aweek of orbital construction for their mission ? one slated to be the finalflight of Atlantis. Atlantisundocked from the space station at about 11:22 a.m. EDT (1522 GMT) while bothspacecraft flew 220 miles (354 km) above the Indian Ocean southwest ofAustralia. The 25-year-old shuttle is due to land in Florida on Wednesday and beretired later this year. Shuttlecommander Ken Ham said the two crews, which added up to 12 people on the linkedAtlantisand station ? had great fun working together, but it was time to head home. Thetwo crews shared hearty hugs and handshakes before going their separate ways. "Ofcourse, it will be a little bit sad," Ham told the station crew. "Butwe'll see you all on the surface of planet Earth soon." Stationastronaut Tracy Caldwell Dyson, of NASA, rang the ship's bell on the orbitinglab ? a tradition for departing spacecraft. "Havea safe trip back and Godspeed to you," radioed station commander OlegKotov, a Russian cosmonaut, to the shuttle crew as Atlantis headed home. "Andthank you again." Shuttlepilot Dominic "Tony" Antonelli flew the orbiter on a victory laparound the station so his Atlantis crewmates could see the fruits of theirlabor at the orbiting lab. The shuttlelaunched on its 12-day mission on May 14. Duringtheir flight, the Atlantis crew attached a new Russianresearch module to the station, replaced six solar array batteries anddelivered a spare antenna and other cargo. The$100 billion space station is about 98 percent complete in terms of habitablevolume and weighs more than 816,000 pounds (370,131 kg). "Thisplace is now a palace. It's huge and I've had a great fun exploring it,"said Atlantis astronaut Piers Sellers, adding that it's been fun exploring theoutpost. "We're seeing the station pretty much in its final form and it'sreally magnificent." Constructionbegan on the station in 1998 by 16 different countries. Today, it is thelargest human-built structure in space, home to six people from three differentcountries and can easily be seen in the sky on clear nights with the unaidedeye. The$200 million Rassvet module is a 19.7-foot (6-meter) cylindrical room thatdoubles as a docking port on an Earth-facing spot on the station'sRussian-built Zarya control module. Its arrival boosted the station to13 rooms, counting its small seven-window lookout dome. Metalshavings were found floating inside the Rassvet module, but the module's fansand air filters should clean up the debris, station managers said. "Thenew module Rassvet looks really, really good," Kotov told reporters earlySunday. It will be used primarily for research, he added. Morethan a ton of supplies is also packed away in the new Russian chamber, which iscalled Rassvet (Russian for "Dawn"). Threespacewalks were performed by the crew of Atlantis to upgrade the station. Thespace station crew still has a busy few weeks ahead. Kotov and two othermembers of the station's six-person crew plan to return to Earth on June 2aboard their Russian Soyuz spacecraft. A new trio of spaceflyers will launchsoon after to replace them. NASAwill launch one more new room, a storage closet, to the space station withshuttle Discovery in September. Russia also plans to deliver one more, largercompartment in the next year or so. Onlytwo more shuttle flights remain after this one (on Discovery and Endeavour)before NASA's shuttle fleet is retired. Whilethis mission is Atlantis' 32nd and final scheduled mission, NASA and somelawmakers are lobbying to fly the shuttle one more time in June 2011. NASAalready plans to prepare Atlantis for flight as a precaution. The orbiter mustbe ready to serve as a rescue ship for NASA's final shuttle mission onEndeavour in late November. NASAcurrently does not have approval for an extra shuttle mission in 2011.President Barack Obama's administration would have to order the flight and signoff on extra funding for it by the end of next month to make it happen, NASAofficials have said. Antonellisaid he wasn't sure what would happen with Atlantis after its final flight (museumsacross the United States are vying for the three orbiters) but he knew wherethe shuttle would go if he could pick: His own backyard. Butfirst, the crew of Atlantis has to return home. OnMonday, the astronauts plan to inspect their spacecraft's heat shield for anynew dings caused by space debris or micrometeorites. The shuttle has alreadyreceived a clean bill of health with respect to any launch debris. Shuttleinspections have been standard since wing damage from debris led to the tragic2003 loss of shuttle Columbia and its crew. OnTuesday, the Atlantis crew will ready the shuttle to once again fly in Earth's atmosphere.Landing is set for Wednesday at 8:48 a.m. EDT (1248 GMT) at NASA's KennedySpace Center in Florida.